My friends and I went sea glass hunting yesterday at Headlands Beach State Park in Mentor. The weather called for high winds and chilly temperatures, but we still were determined to go in hopes of finding some treasures. Getting to Headlands Beach is pretty easy; Heisley Road pretty much leads directly into it. Once we got there after our long car ride, we were disappointed to find that the restrooms were closed at this time of the year. Not a big deal; there were also portable restrooms that were pretty nice. The beach is quite a long way from the parking lot. Usually, I don’t mind lengthy walks, but unfortunately, the wind put a damper on the journey, as it made things COLD! Finally, after surviving our treacherous trek across the sand, we made it to the water. The waves were HUGE that day, and if it wasn’t forty degrees and windy, I would have loved to have gone swimming. Alas, that was not what we had come here for, so we began our hunt for shiny objects. Although we were only there for an hour, I’d say we had pretty good luck. Each of my friends found decently sized pieces (between nickel and quarter width) in different colors, particularly turquoise and Kelly green. My one friend, who had never been sea glassing before, had a particular knack for finding desirable turquoise pieces. 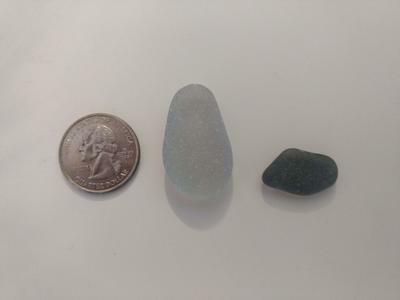 One piece was an oddly shaped nugget with sand embedded in it; perhaps bonfire glass? Another piece was a well-frosted ridged piece. Both pieces were fairly large. duration of the hunt. During this trip, I acquired the largest piece of cobalt blue glass I’ve ever found. A lot of my white, Kelly green and turquoise pieces were also very nice, but the real superstars of the day were the two pictured in the second photo I posted with this article. I photographed them with a quarter for size reference. The first piece was the biggest piece I found all day and definitely the best frosted. I dare to say that it is, ideally, the perfect piece of sea glass. When I found the piece, it was like a fairy-tale moment: Girl casually strolls down the shore observing the beauty of nature when all of a sudden, she looks down and voilà! A priceless treasure, resting peacefully in the sand, waiting for someone to claim it. I eagerly showed my friends as soon as I found it, claiming it was my “jackpot piece” of the day. At first, I thought the piece was white, but taking a closer look at it, I noticed that it has a bluish/grayish tint to it. Maybe the sun’s rays made it this color, or perhaps it was never white to begin with? Either way, I plan to make it into a wire-wrapped necklace, which I assume will be absolutely gorgeous! My second celebrity piece is one that I am conflicted on color-wise. It is either gray or a grayish-purple/lavender. I’ve never found a piece this color and I have no idea where it came from. Still, it’s an exciting find nonetheless. I would definitely come back to this beach to hunt again. It took a little digging and patience to find many of these pieces, but it was well worth the effort.